We take for granted sometimes what some people struggle with on a daily basis, falling in love. Here we have Charlie Darby who has everything going for him, but the simple task of falling in love literally drives him insane. Charlie (Matt LeBlanc) decides to give up on love because he has had relationship after failed relationships with women that in his mind, did him wrong. Of course he meets a beautiful woman that he feels is perfect for him named Molly (Ali Larter) and this is where the chaos and the antics begin. The story is narrated by Charlie’s best friend Jason (Adam Rodriguez) who tries to be Charlie’s voice of reason after he realizes Charlie really is insane! This is a great feel good movie! I laughed throughout it, because we all know someone who has acted like this, if not ourselves. Valentine’s Day is around the corner and everyone should consider taking their sweetie or that crazy friend that is Lovesick to see this movie. Not once did I think of Matt LeBlanc as Joey. Good job Matt! The movie has a cast of characters that include Chevy Chase, Kristen Johnston, Rachael Harris, Rebecca Naomi Jones and Carsen Warner that will have you laughing out loud. By the way, this is not the same movie that was released in 1983 with the same name. 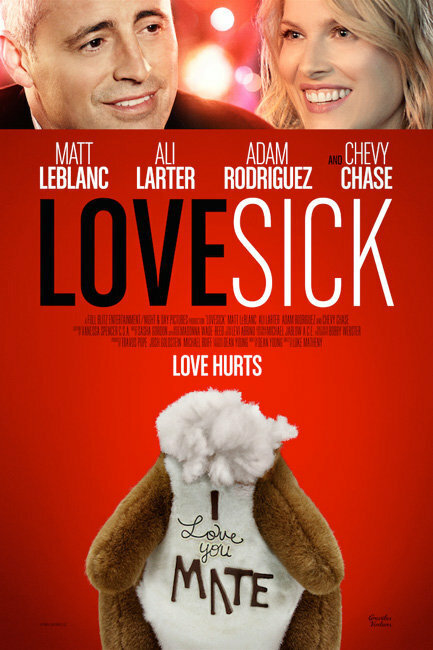 Comments for Lovesick Starring Matt LeBlanc, Ali Larter, Adam Rodriguez and Chevy Chase are now closed.